Home | Blog | Weekender with Wanda – Birthday Cake Wishes! 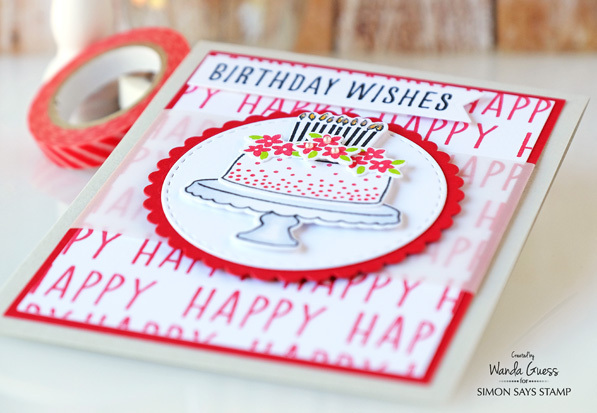 Weekender with Wanda – Birthday Cake Wishes! Hello friends! Happy Saturday! 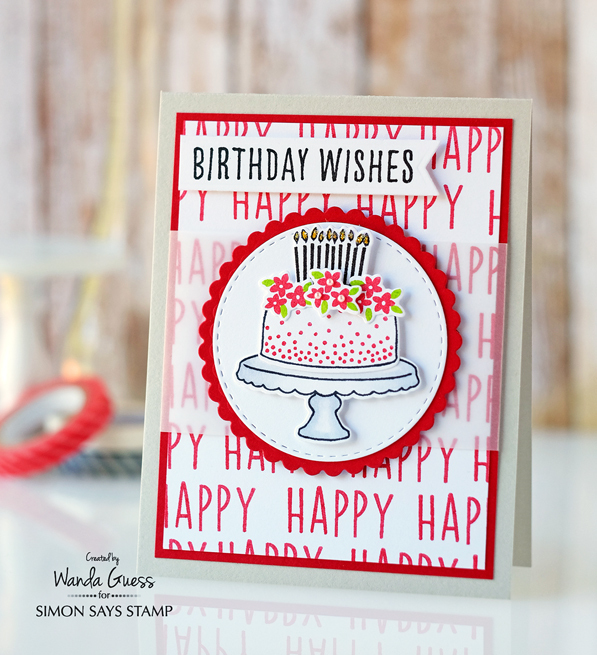 Welcome back to the latest edition of Weekender with Wanda here on the Simon Says Stamp blog! Always nice to see you here on the weekend! Hope you had a great week. I have been crafting up a storm in my studio, which is a good thing, because it’s been over 100 degrees every day for a week where I live. Yuck! So Buddy, my trusty studio side kick, sleeps all day and I make cards. It’s a good life. Ha! 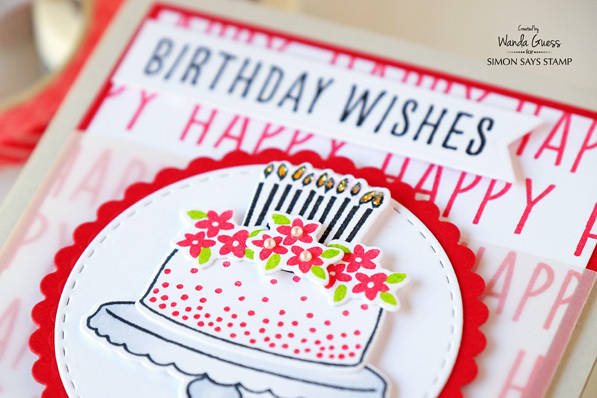 Today I’m sharing a happy birthday card made with products from one of the awesome companies we carry – Reverse Confetti! They have a new-ish line of cake building stamps (Candles n Confetti) and matching dies that I loved from the moment I laid eyes on them. They are so versatile and pretty, and you can make about 100 different combinations of cakes using all the pretty add ons. I always need more birthday cards, don’t you? For this card I started with a Fog Cardstock card base. I layered pretty red cardstock with it. This is such a clean and classic color combination. 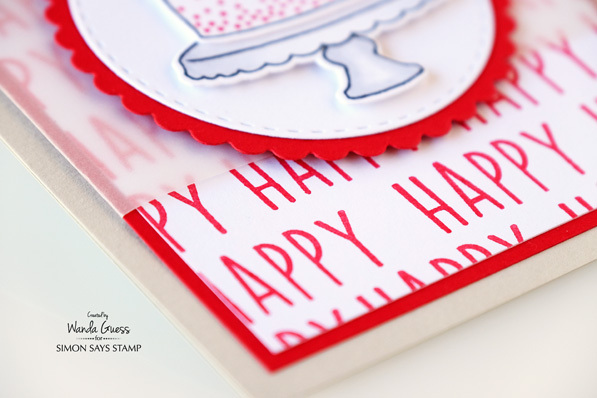 I created my own background paper by stamping the word “happy” from the Whole Lotta Happy stamp set multiple times in red ink. This is a really fun way to tie a project together. I stamped the Birthday Wishes sentiment onto a banner using Intense Black Ink from Simon Says Stamp. You can also see that I wrapped a strip of vellum around the top two layers to tone down the color and make a frame for the center piece. I stamped and die cut out the cake stand, the cake, and three of the little flower clusters. Then I stamped the red polka dots onto the cake. The cake stand was very lightly colored with a Copic Marker to match the grey cardstock base. 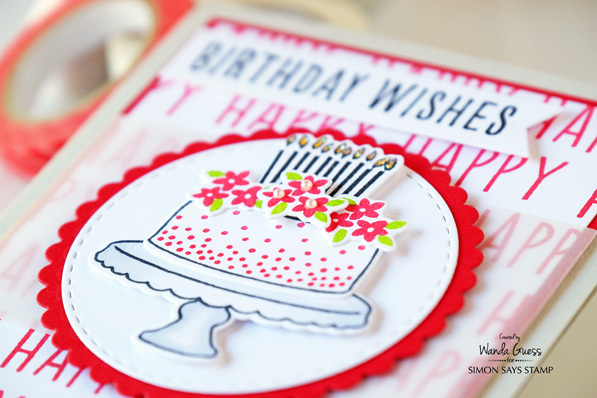 I layered a Stitched Circle die in crisp white onto a red scallop to create the center of my card. The cake, etc was attached using foam squares. Here’s wishing a HAPPY day to all of you! Thank you for visiting and hope the rest of your weekend is delightful! FYI – Next Saturday we’ll be having a big blog hop with some exciting new products for you! So, Weekender with Wanda will be back on the 23rd! Blog Candy Alert!! Follow our blog via email and comment on this post for a chance to win grab bags and blog candy! Remember to tag your awesome projects with #simonsaysstamp on social media so we can see what you are creating! See you next weekend! Fun card, love the bright colors! Awesome birthday card – love it! Always trying to come up with different birthday card ideas and I love this one! Great idea for the background!! Great card!! Love the use of the vellum! beautiful card! Oh wow! Such adorable card! Love it! Now that’s what a call a VERY HAPPY birthday card – LOVE IT!!! Fabulous birthday card! Love the color combo & layout! Thanks for sharing! 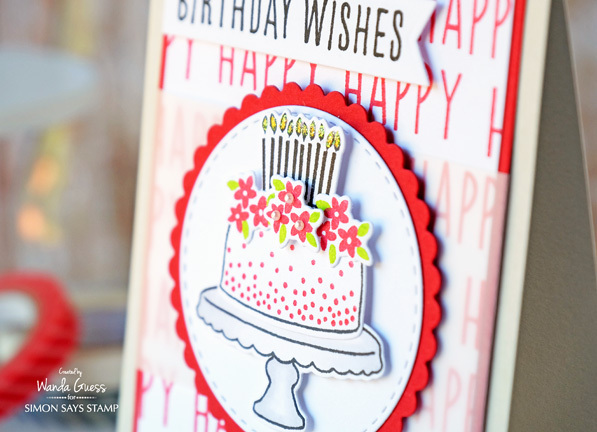 Love the sentiment paper you created, such a sweet birthday card! Love the sentiment background for this fabulous cake card! Love the cake with candles, and the sentiment filled background, a beautiful make. Such a super card! The dimension on the cake and its elements looks fantastic!! Love this card! so bright and cheerful. I really like the colors you used!!! Who wouldn’t LOVE receiving this card in the mail on their special day?!?! Love it ! Love the bright happy red! I wouldn’t mind receiving A card like this got my birthday! It is lovely! Such a beautiful card!! Love the colors!! Love it! 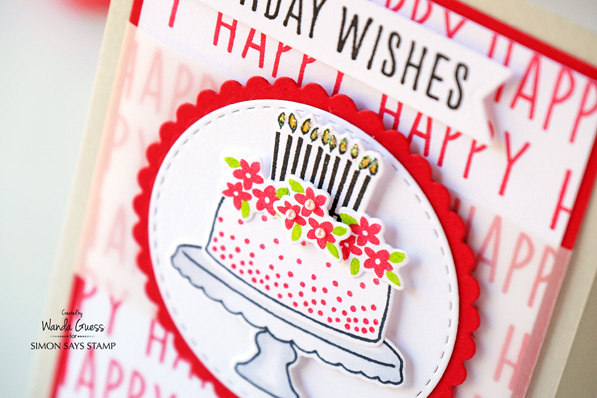 So bright and cheery, just like a birthday card should be! Such a beautiful card! So happy and cheerful! Great stamp sets! I love the cake stamp and die and how you made it the focal. Super card ! Love the colors and design and all the dimension you gave the cake !!! Very cute birthday card !! Wonderful card! I usually have a hard time with birthday cards so definitely going to “lift” this one, Wanda! Well done! What a Wonderful Birthday card!! Your cake does look delicious. Love the little flowers on top. What a simply pretty card. It makes me want a piece of cake…but not a birthday!